Soon many people may be wondering where all these links that have http://t.co/ in them are and if they can be trusted. The short answer is that they are auto-generated by Twitter as it is their new self-built URL shortening service & they can be trusted as much, or as little as other shortening services. You may recognize .co as being the TLD for domains for the country of Columbia. Colombian domains have long had rules that they must be registered by Colombian-citizens only, much to the dismay of domainers, as .co typos are far more common then other accidental domain TLD truncations like .cm (Cameroon) or .ne (Nigeria). I’d expect far more people accidentally type in “Amazon.co” & hit the enter button before the “m” then leave out the “o” in .com (Amazon.cm). In early 2010, Columbia decided to open it up registration to anyone (doesn’t open to public until 7/20/2010), starting with registered trademark owners and companies that apply to be “.co founders” (companies that are going to do something neat that helps the validity of .co domains). 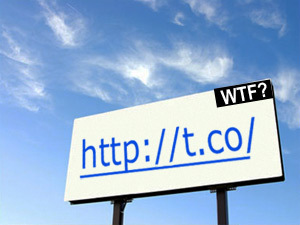 So, Twitter was granted t.co and is using it for its built-in URL shortening service. Many different URL shortening services sprung up, but Twitter did choose URL shortening services automatically for anyone using long URLs. They started with one of the oldest ones: tinyurl, then eventually defaulted to bit.ly. Both services were provided by other companies. Hence why it makes sense that Twitter finally created their own: t.co. Right now, t.co is live for direct messages (they used twt.tl for a few months), but will be rolled out for all tweets soon. Another benefit of many URL shortenings services is analytics – they provide data on how many clicks your shortened link got, and in some cases, where they were shared. With t.co, Twitter said it would share analytics to companies using Twitter’s commercial services. It is unclear if they will also open data up to the general public. URLs shared on Twitter have long been no-followed, but the links are often spread throughout the internet outside of Twitter, even in places that follow the links (a blog post inspired by a link shared in Twitter, for example). This means the type of redirect the URL shortening service uses, matters for SEO. If it is a 301 redirect, the link can still pass a vote to the site or page, in the eyes of the search engines. A 302, however, doesn’t benefit the page or site. This is why I’ve long approved of clients using tinyurls or bit.ly, but not twurl (twurl.cc) and, until recently, told people to steer clear of Hootsuite generage links (ow.ly). The good news is that I’ve tested t.co links and they are using 301 redirects, which means if the t.co link is spread around the internet, you may receive the SEO benefits. I wrote this post because I fully expect people will be caught by surprise when they start seeing t.co links everywhere – not just on Twitter, but on Facebook, email, texts, etc. If you read this post all the way through, you’re now an expert on the history of the t.co domain.